The US Agency for Toxic Substances and Disease Registry (ATSDR) has published a vast body of information covering a wide range of toxic substances.1 To provide easy reference and present uniform instructional information, we have defined the following six (6) areas covering specific toxic exposure-related issues in which TCAS has developed extensive expertise and experience. These have typically resulted in risk assessments, written reports and expert testimony, subsequent to being retained by defendants, plaintiffs, prosecutors, state attorney generals and/or public defender's offices, U.S. Dept. of Justice, U.S. Navy, etc. Click on your area of interest to view additional information. U.S. EPA defines a toxic substance as "...any chemical or mixture that may be harmful to the environment and to human health if inhaled, swallowed, or absorbed through the skin. "2 This can include poisons, chemicals, biological agents, radioactive materials and other substances. 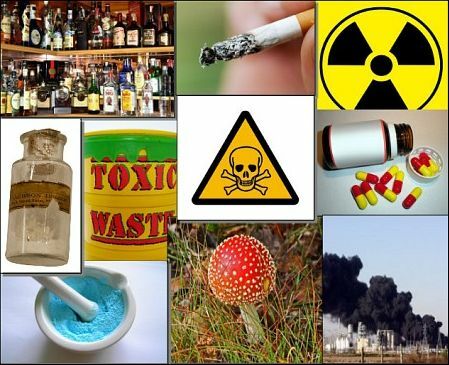 Toxic substances can be naturally-occuring or man-made. They can be ingested individually or in combination with other substances, accidentally, consciously or unknowingly. Toxicological effects can be caused by individual substances or in combination with other substances. Simple toxic mixtures (such as cleaning chemicals, drugs of abuse, pharmaceuticals, etc.) generally contain a well-defined number of components, whereas complex mixtures (such as industrial releases, diesel exhaust, cigarette smoke, creosote, etc.) can contain thousands of different chemicals. These, in turn, may vary in composition or over time depending on the sources and circumstances of exposure. A basic toxicological principle is "the dose makes the poison." Most non-toxic substances have the potential to become toxic if ingested in sufficient quantities to produce adverse health effects. Even normally harmless substances (such as table salt) can produce toxic effects and can even be fatal — if a sufficient quantity is ingested. The toxicologist's key tasks are to identify which substances are (or were) present in an exposure scenario and establish the circumstances and dose per exposure. From these, the totality of exposure effects can be determined. The expert toxicologist must (a) identify the substance(s) at issue, (b) calculate the degree of exposure and exposure pathways for each substance, (c) apply the appropriate toxicity values for the various exposure pathways and dose(s) and (d) characterize risk levels and causative factors (if any) based on the totality of objective evidence. The vast number of toxic substances requires the expert toxicologist to apply a strict set of methodological procedures to every assessment. Toxicological weight-of-evidence (WOE) is a fundamental methodology for defining (or ruling out) causal relationships between events and consequences. Concordantly, dose calculations are key components in an objective toxicological assessment. Dose refers to the amount of a substance which an individual has ingested, absorbed or inhaled in a specific period of time. The toxicologist applies dose, time, exposure pathways and many other variables in the context of toxicological methodologies from which an assessment is subsequently derived. Ultimately, it is the expert toxicologist's responsibility to evaluate these many factors and render an opinion with respect to risk and/or causation. A scientifically credible toxicological opinion must meet many requirements. Toxicological findings generally take the form of a written report or affidavit and must comply with all legal requirements for expert testimony, particularly the application of generally-accepted, peer-reviewed methods. By applying a generally-acepted procedure using recognized, accredited investigative techniques, the expert toxicologist can offer an opinion to reasonable toxicological certainty. Note that such an opinion is not deemed to be a conclusive fact — it is the outcome of correctly applying the methodological steps to arrive at a scientifically credible determination. In matters of litigation, accuracy and professionalism can significantly impact the outcome of a case. An objective toxicological assessment can be exceedingly complex involving in-depth research, application of a wide range of investigative techniques and interpretation of data in accordance with established toxicological and scientific principles. Consequently, good communication skills are essential in conveying simplified, understandable toxicological findings to a judge and jury. Although training, accreditation and experience are all virtues in assessing risk and demonstrating (or refuting) claimed causation, scientific credibility often rests in the eye of the beholder. Extreme care must be applied to every aspect of a toxicological assessment. The expert toxicologist must be fully prepared to defend his/her opinions as opposing counsel may aggressively challenge toxicological opinions in deposition or cross-examination and will frequently file motions to exclude testimony. Scientifically credible toxicological opinions must rely solely upon the accurate compilation of pathway-specific exposure data, correct application of generally-accepted, peer-reviewed methods and the totality of toxicological weight-of-evidence. For more than 28 years, TCAS has been regularly retained for expert toxicological consultations and assessments involving toxic substances. See toxicological case studies for historical information relating to toxic substances encountered in past cases. Refer to toxic exposures, causation evaluation, exposure assessment and risk assessment for descriptions of some of the procedures and methods used to conduct toxicological investigations. We invite you to contact our office for answers to any questions. "With more than 7 million known chemicals, each must be assessed according to the objective scientific evidence available. Peer-reviewed methods must always be applied to establish or refute causation to reasonable toxicological certainty."